Painting a Needlepoint Canvas Is Easy & Fun! Painting needlepoint patterns on canvas is one of the easiest and fun ways to bring more creativity and enjoyment to your stitching. Not only is the experience rewarding, but you will save money by doing-it-yourself instead of purchasing expensive hand-painted designs or machine-painted and mass-produced needlepoint kits. Why Bother to Paint Your Own Canvas? If you've ever purchased a painted canvas and have had difficulty figuring out what color to use at a canvas mesh intersection or motif boundary, then learning to paint your own canvas is definitely something you will want to do. It's a terrific alternative to budget-breaking designer canvases or poorly-stamped machine needlepoint kits. Simply design your own patterns on paper or use free needlepoint charts, and then paint them on blank needlepoint canvas yourself! It's quite easy. All you have to do is to follow a few basic guidelines. Waterproof Acrylic Paint - Opaque, rather than transparent paint should be used for best coverage, so read the paint labels carefully before purchasing. Liquitex Opaque Acrylic Artist Color, Delta Ceramcoat and similar brands are great for painting on needlepoint canvas because they come in a variety of basic colors that can easily be mixed with water or textile medium for an infinite array of colors. These paints are also inexpensive and easy to find. Do not use common craft acrylics available in little pop-top bottles, as the paint's coverage is often not optimal for painting on canvas. A Set of Synthetic Paint Brushes - Using sable or other natural fibers on stiff canvas will result in ruined brushes and a sloppy paint job. Good Quality Blank Mono Needlepoint Canvas - Make sure that there are no burrs or loose strings that can cause the colors to run into each other. Design Chart - A color photograph, printed needlepoint chart or a line-drawing or sketch of a design can be used as a template for painting a needlepoint canvas. Masking Tape - Get the kind that painters use to make it easier to move the paper pattern and needlepoint canvas as needed for painting. Bowl or Cup of Water - This will be helpful for cleaning brushes and mixing paints. Roll of Paper Towels - Great for cleanup as well as for wiping up painting mistakes. Paper Paint Palettes or Aluminum Foil - These will be used to mix your colors. Plain or Butcher Paper - Use a piece to either cover your working area or one that is slightly larger than the canvas you will be painting. Waterproof Pencil - To be used for drawing shapes of design elements on the canvas to prepare it for painting. Craft Table - Use a table with a hard surface and enough space to hold your supplies as well as the needlepoint canvas and template. It is easiest to paint from a needlepoint design chart. Each square on a chart corresponds to one intersection of canvas mesh. To paint the design, simply follow the chart. It's a lot like painting by numbers. Here's how to do it. Cover the working surface with a piece of plain paper or butcher paper. Use a piece that is slightly larger than the canvas to be painted to keep the surface paint-free. Tape down all sides, making the paper as smooth and taut as possible. Place the pattern template on the paper and tape down all four sides. Position the needlepoint canvas over the pattern template and adjust it as needed until you are comfortable with the placement. Tape down the canvas at the top or one side only to form a temporary hinge to hold it in place as you paint. This will allow you to move the canvas to clear holes of excess paint and to make sure you are working true to the design. Draw the shapes of the main motifs or large design areas on the canvas. Don't worry about the intersections at this point. They will be adjusted as you paint. Mix the paints to the desired color. For best results, the paints should be thinned to the consistency of heavy cream so that it will flow well, but still cover the canvas. Paint the design. 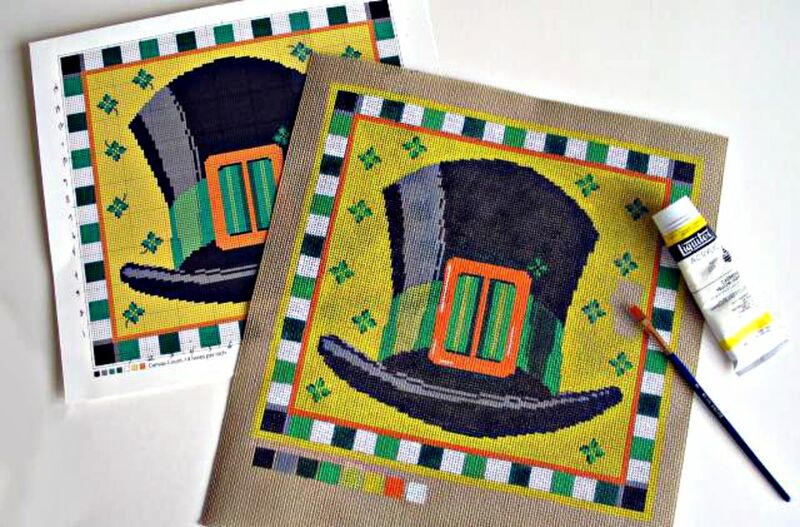 Each color should be clearly painted on each intersection of canvas mesh (see the above image of a corner of the Leprechaun's Hat painted canvas). An intersection of canvas mesh with more than one color is confusing. When painting free-hand, rather than from a chart, watch for multicolored intersections and be sure to repair them by making certain they only contain one color. When you have finished painting the canvas, let it dry completely. Any holes blocked by paint can be easily opened by inserting a tapestry needle and wiggling it around in the hole. Now you can Bind the edges of the canvas and start stitching!